Pre-Calculus will emphasize a study of trigonometric functions and identities as well as applications of right triangle trigonometry and circular functions. Students will use symbolic reasoning and analytical methods to represent mathematical situations, express generalizations, and study mathematical concepts and the relationships among them. Students will use functions and equations as tools for expressing generalizations. This class is your typical math class. We will cover new material, have homework, quizzes, and tests over this material, and have valuable conversations in the classroom. 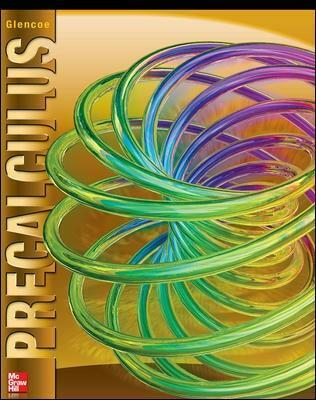 The book we use, McGraw Hill’s Glencoe Precalculus (Carter, Cuevas, Day, Malloy), is pictured below. Each student will get a copy of the book to keep in the classroom, a copy to take home for the year, and (if they choose) a copy for their locker should they need it at school while not in my classroom.